I’m getting ready for a craft night at my house in February with a group of women. My nephew’s wife started the first one this month which was a lot of fun….so I volunteered to do the 2nd one. 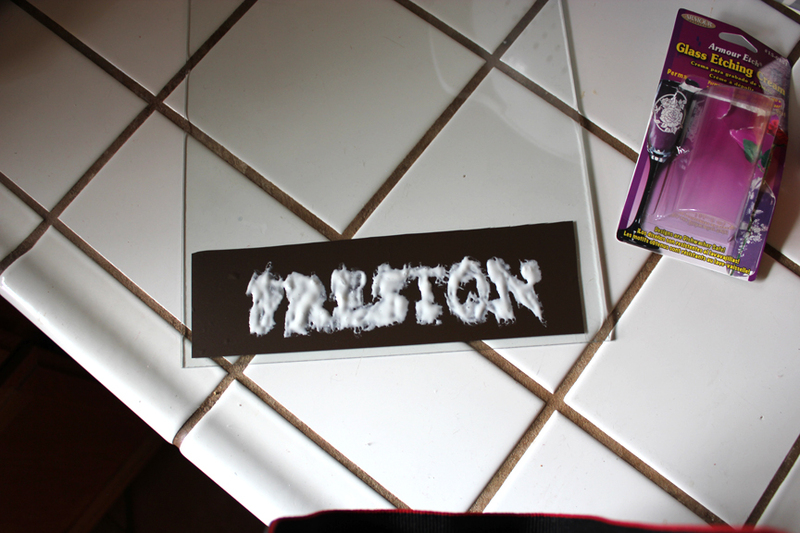 We are going to do glass etching. 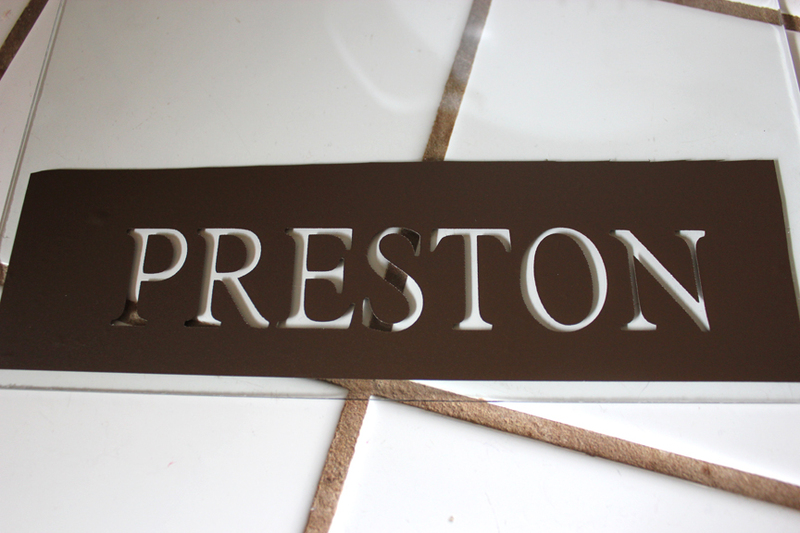 For this project, I cut the word Preston out of vinyl using my Cricut electronic die cutting machine….then used a glass etching cream to frost the glass on the picture frame. 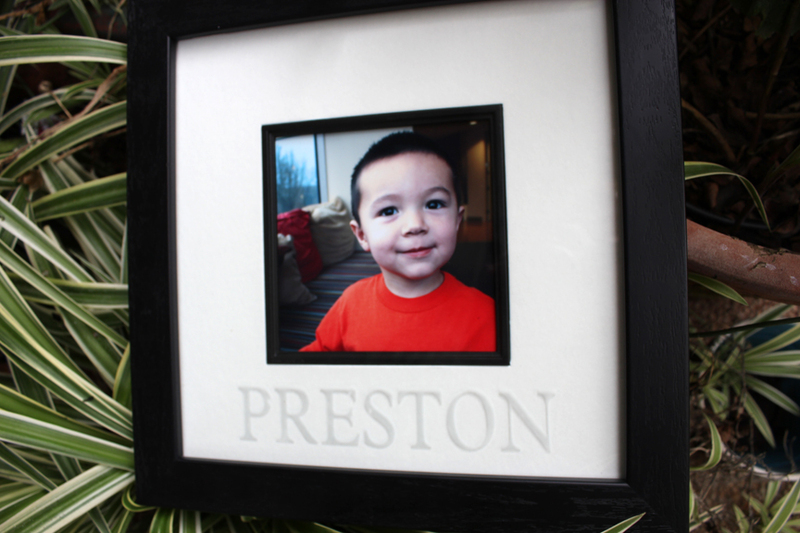 I got this frame on sale at Michael’s for $4.69…so with the cost of the vinyl and the glass etching cream…I’m sure this is well under $10.00 when the expense of the vinyl and the glass etching cream is spread out among the participants. 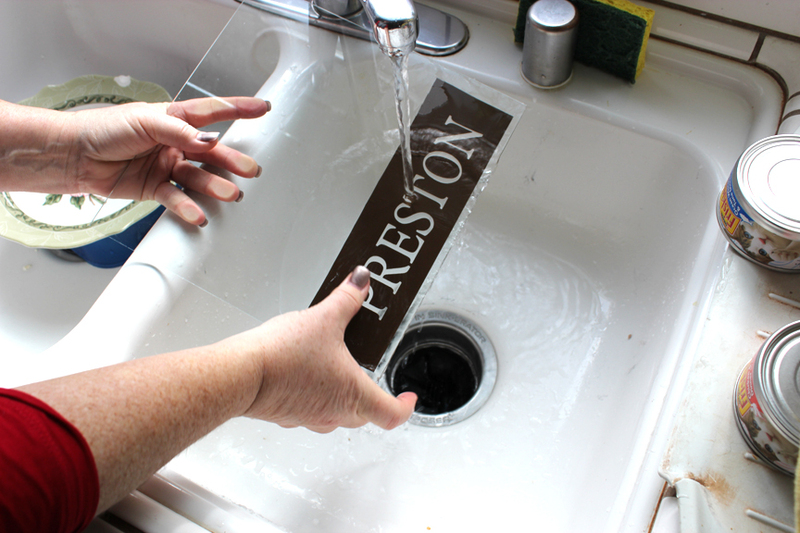 First I cut the word with my Cricut and pulled it off the cutting mat and placed transfer tape on the top of the vinyl. Then I carefully pulled out the letters, making sure to leave the middle part of the letters, P, R, and O. Then I pulled of the paper backing to leave the sticky part of the vinyl showing and carefully lined up and placed the vinyl on the glass. Then slowly peel off the transfer tape. I then turned the glass over and made sure all the bubbles were out and the vinyl pressed up all around the letters tightly to the glass. 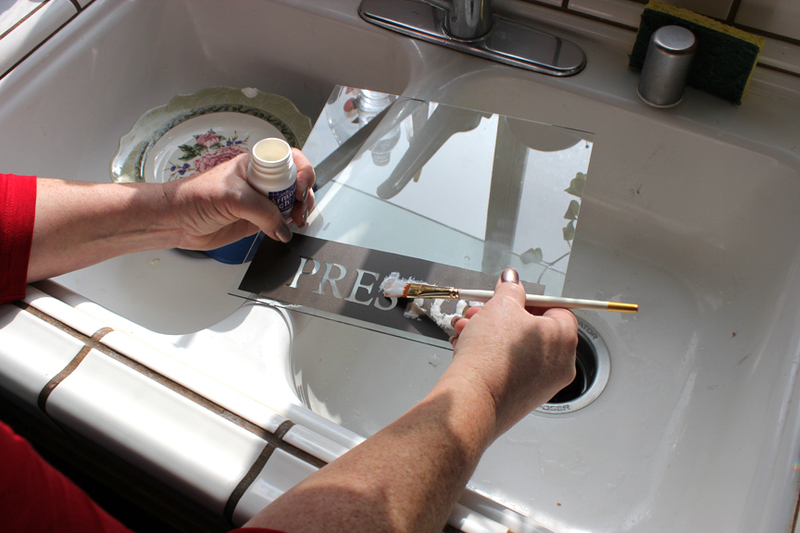 Next we paint on the glass etching cream with a good thick coat. Let it sit for a good minute or two….it doesn’t take long and I’ve found that leaving it on longer doesn’t make a better etch. It really does only take a minute. 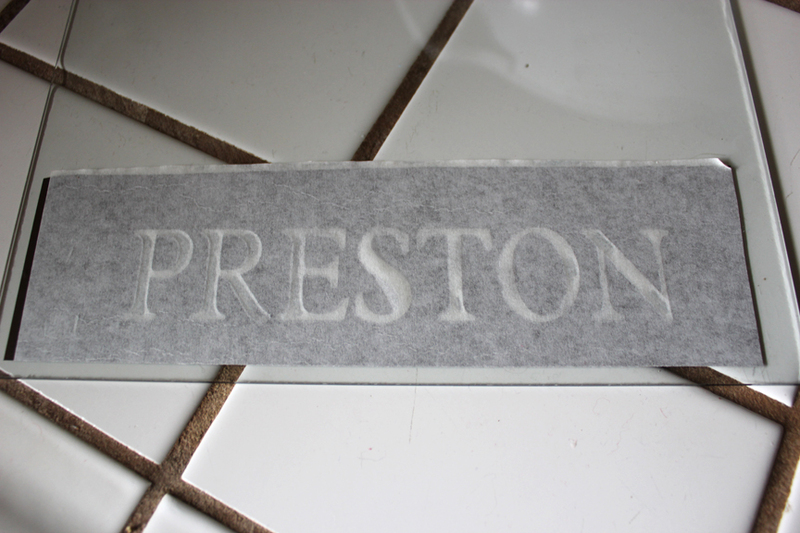 I wet a few paper towels…and carefully wipe the excess etching cream making sure not to wipe it onto the other parts of the exposed glass. The cream will dull your sink that’s why I wipe most of it away before I rinse. Wet a second wad of paper towels if you can’t get most of it off the first time. 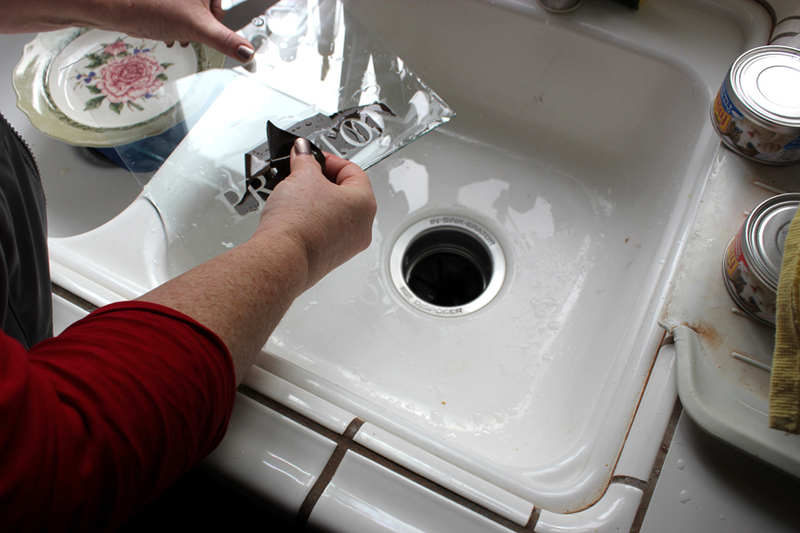 Rinse with clear water under the faucet. 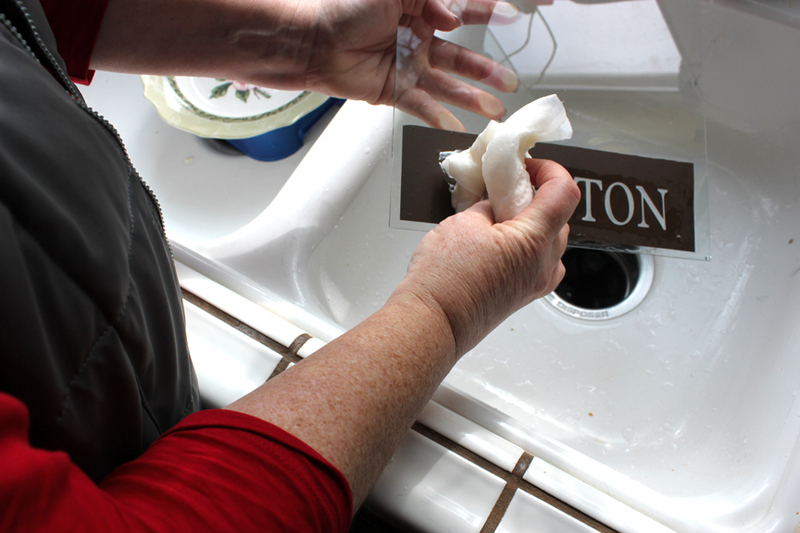 Peel off the vinyl and wipe dry with paper towels….then spray with Windex and dry thouroughly with paper towels. If you have a good printer, print up a picture on photo paper. The photo opening for this frame is 5 x 5 inches….but I left my photo paper larger and taped it to the back of the frame. Assemble picture and glass and secure in the frame. This entry was posted on Monday, January 24th, 2011 at 2:18 pm and is filed under Uncategorized. You can follow any responses to this entry through the RSS 2.0 feed. You can leave a response, or trackback from your own site. Thanks Melanie! Really very simple and it turns out pretty good too. Looks much better in person. So wonderful – I’m going to steal this idea from you! So cute! I can’t wait until Craft Night!